Flathead Lake in Montana is one of the 300 largest natural lakes in the world and the largest natural freshwater lake west of the Mississippi River. Being so large, the lake attracts real estate investors, vacation home buyers and waterfront enthusiasts to its shoreline. According to studies done at the Flathead Lake Biological Station in Yellow Bay (located just south of Bigfork, MT), the water in Flathead Lake is among the cleanest in the world. Every New Years, folks take to the lake for the annual Polar Bear Plunge in Woods Bay on the eastshore and the plunge in Polson Bay on the south shore. The annual Dragon Boat Festival is a newer event on the shores of Flathead Lake. Sunbathers and swimmers enjoy the rocks at Wayfarer State Park. Flathead Lake real estate would be considered mostly developed with vacation homes for sale, high end custom lakefront homes, cabins, condos on or with access to Flathead Lake, and few unimproved land or property sites available for sale . The Flathead Lake real estate market has reflected the inventory over the years with “hot years” showing only a handful of homes for sale, and also slow sales years with high inventory of over a 150 homes for sale. 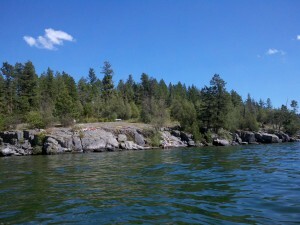 Being that the The Hollinger Team has been around since the early 1980s, we’ve sold ALOT of Flathead Lake property. Recently we put together a map showing all the Flathead Lake homes and land we’ve sold over the years, at least that we can remember going back that far! The yellow dots indicate properties we’ve sold in multiple transactions. Use the map below to scroll in and out; we’ve probably sold something near where you are interested in purchasing and have knowledge of the area. Or, if you are one of our returning customers zoom in to your sweet spot on the map!